The Macintosh 128k was released in January of 1984 by Apple. The price was steep, selling at a whopping $2,495 It was considered on of “the first affordable computer to include a Graphical User Interface” (Rasmussen). This model was a better and faster processor than the ones that came before. When purchased the monitor came with a keyboard and mouse, as well as to a floppy drive that was a new addition to the personal computer. All of these parts fit into the case that Apple created. As this was the first personal computer to hold new characteristics in comparison to others, Apple was able to build and create computers that were more innovative than most. The two photos above display an array of Apple products and the progress Apple has made with their computer products. Today, the desktop computer that Apple sells is the “iMac,” which sells in the range of $1,009 and $1,499. It comes with different sizes of storage, graphics, and processors. 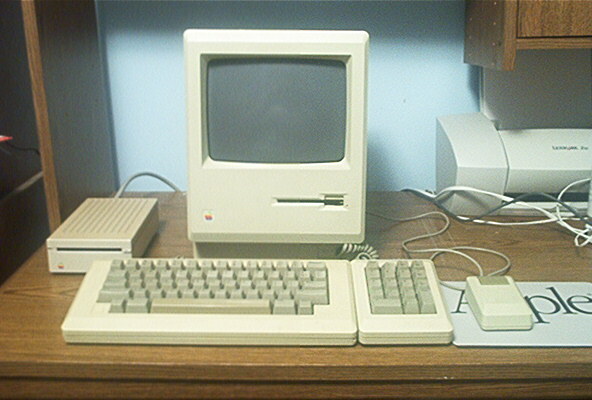 It is also available to customize to the consumers liking, unlike the first personal computer Apple created, the Macintosh 128k. Extras: It has a handle on the case! 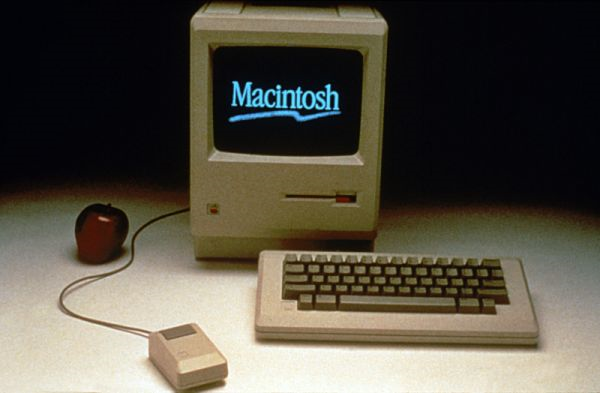 The Macintosh 128k had a 9 inch screen size, 0.13 MB of memory, a floppy drive, a black and white screen type, no wireless connectivity, and a keyboard that connected to the physical computer. Today, the iMac has a 27 inch screen size, 8 GB of memory, a color IPS LED screen type, wireless connectivity, and a wireless keyboard. The features of Apple’s first personal computer, and their newest model of their personal desktop computer are widely different. When Apple released the Macintosh 128k it was seen as a huge step in creating a personal computer for those who were in need. In 1984 this type of technology was slowly progressing, however in this day and age technology has grown immensely, and improves everyday. Here is a photo of the infamous Steve Jobs with the Macintosh 128k! The first Macintosh TV ad aired in 1984 during the coveted Super Bowl half-time slot. It was directed by Ridley Scott, the man behind Alien, Blade Runner and Gladiator. HOW MANY PEOPLE USE APPLE PRODUCTS? Accessibility is a huge topic surrounding Macintosh and Apple products. Since the price was so high and unaffordable for most people when the Macintosh 128k was released in 1984, not many people had the ability or means to purchase this certain product. It was very exclusive in user base, and was most likely pulled from the market due to the poor sales. Apple certainly found a way to create a computer that was more affordable as the company expanded. They knew they needed to create a less exclusive and more affordable machine that could reach a majority of the population. Today, the iMac sells for less than half of the price of the Macintosh 128k, and many people own this brand of computer. These computers may not the cheapest on the market, but they do have a user friendly graphical interface that appeals to many of the Apple consumers. Apple was able to figure out their pricing and production failures to further construct a computer that was available to the general population at a price that was reasonable. This helped Apple succeed as a company and gain a variety of users. Brand loyalty also comes up when discussing Apple products. Many educational institutions and the general public are loyal to certain brands when it comes to technology. When walking into most university libraries or technology laboratories, including the University of Colorado Boulder, iMac’s are frequently displayed. Although the pricing may not be the cheapest for these institutions, many universities have contracts with Apple that are created so their products are used by students and faculty. This enables Apple to expand their users to those who may not have been able to own a product before attending an institution with a contract. In addition, many students and other consumers are loyal to Apple because they grew up using Apple products. From personal experience, I grew up around the evolution of the iPhone, iPad, iMac, and MacBook’s, thus most of my technology products are Apple. Since I know how to use Apple products, I stick to purchasing them even if the price is considered more expensive than Apple’s competitors. Trying to learn how to use a new interface from a different brand is unappealing for customers of technology. Many consumers stand by the products they know how to use and continuously purchase them throughout their lives. Since Apple was able to build their brand to be affordable and accessible to more people, it has grown in its user base, as well as become an iconic brand in the technology world. “Apple Macintosh 128K.” The Centre for Computing History. The Centre for Computing History, 9 Sept. 2009. Web. 8 Dec. 2015. <http://www.computinghistory.org.uk/det/16643/Apple-Macintosh-128K/>. Linzmayer, Owen, and Glen Sanford. “Macintosh.” Apple Museum. Apple Macintosh, 1 Feb. 2012. Web. 8 Dec. 2015. <http://applemuseum.bott.org/sections/computers/mac.html>. O’Brien, Chris. “How Steve Jobs’ Macintosh Failed and Still Changed Computing.” Los Angeles Times. Los Angeles Times, 24 Jan. 2014. Web. 8 Dec. 2015. <http://www.latimes.com/business/technology/la-fi-tn-how-the-first-macintosh-failed-and-still-changed-computing-20140123-story.html>. Rasmussen, Eric. “Macintosh 128k.” Apple-History. 16 July 2015. Web. 8 Dec. 2015. <http://apple-history.com/128k>. Velazco, Chris. “Apple Sold 33.8 Million IPhones, 14.1 Million IPads, And 4.6 Million Macs In Q4 2013.” Tech Crunch. Tech Crunch, 28 Oct. 2013. Web. 8 Dec. 2015. <http://techcrunch.com/2013/10/28/apple-q4-2013-iphone-ipad-mac-sales/>. Westover, Brian. “1984 Macintosh vs. Today’s Apple IMac: Spec Showdown.” PC Mag. Ziff Davis, 24 Jan. 2014. Web. 8 Dec. 2015. <http://www.pcmag.com/article2/0,2817,2429830,00.asp>. Whitney, Lance. “Apple to Reach 600 Million Users by End of 2013, Says Analyst.” CNET. CNET, 4 June 2013. Web. 8 Dec. 2015. <http://www.cnet.com/news/apple-to-reach-600-million-users-by-end-of-2013-says-analyst/>.